For all your favorite foods, Busy Bee Party Rentals provides the best concession machine rentals in West Palm Beach, Fort Myers, Naples and other surrounding areas in South Florida. These machines are a great way to add fun and flavor to your next party or event. We'll provide your guest with delicious treats so they'll have all the energy they need for a fun Florida day. Why not turn your next event into a carnival midway with some tasty treats? The smell and taste of these delicious snacks will conjure up great memories with adults and creating new memories for the kids. All of our concession machine rentals are delivered clean and sanitized for your safety. Bring a smile to everyone's face with some fluffy cotton candy. 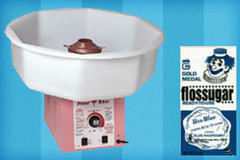 Our cotton candy machines can churn out dozens of fluffy cones in a matter of minutes. Whether you're having a company picnic, a backyard birthday party or a school field day, your guests are guaranteed to have a magical time with this crowd favorite. 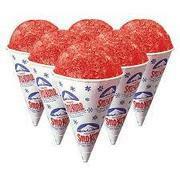 How about beating the Florida heat with our coolest treat? 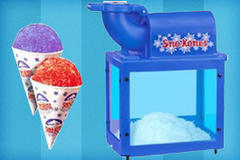 The best way to keep your guests cool on hot summer days is with our snow cone machine rental. 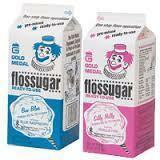 This sweet and frosty treat has become a staple for years. These machines are incredibly easy to operate and are guaranteed to be the hot spot at your next party or event. Get the party poppin' with some delicious popcorn. Your guests will be drawn to the irresistable aroma of popcorn from blocks away. As soon as the kernels start popping, watch the crowds clamor to grab a bag. A party just isn't a party without the great taste of popcorn. 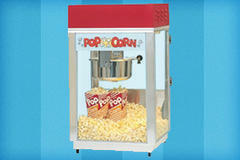 Our popcorn machine rentals will be a welcomed addition to your event. Busy Bee Party Rentals has the best selection large, colorful bounce house rentals for our customers in Fort Myers, Naples, West Palm Beach, , Lehigh, Immokalee, Loxahatchee, Wellington, Clewiston, Belle Gladeand other surrounding areas in South Florida. Browse the selections below and click the image or title for more information and to request a quote. We welcome all questions, please contact us for inquires and orders. Reserve the best concession machine rentals in West Palm Beach, Naples, Fort Myers and other areas in South Florida.